Press release: Irish Oil and Gas Resources could SAVE us YET! Unfortunately this is not a real Shell statement. The speech is by the Yes Men (http://theyesmen.org) in an effort to try to shame Shell. Good luck!!! Solidarity action in Belfast (as well as London) shows continuing support of the Shell to Sea Campaign against the exploitation of public fossil fuel resources and the arrests of citizens in Rossport, West Ireland. Court rules Garda Supt. M. Larkin responsible for Violation of the Rights of Shell to Sea activists. Shell to Sea Protesters were Unlawfully Detained by An Garda Síochána within Shell Compound for 'operational reasons' which did not satisfy Judge. On Thursday 25th March 2010 at Belmullet District Court, charges against 9 Shell to Sea protesters were withdrawn or dismissed by Judge Gerard Haughton, because the '9' had been unlawfully detained following their arrest and they were not brought to court 'as soon as practicable', amounting to a 'conscious and deliberate violation of their constitutional rights'. In the 'test' case of Mr Eoin Lawless, potentially effecting all of the 9, the court ruled that the accused was/were held for an unreasonable amount of time before being charged, they were denied 'station bail' and were unreasonably delayed before being brought to court to allow them to apply for release on bail. Barrister Leo Mulrooney, acting for the 9, had put it to Garda Superintendent Michael Larkin that he had failed in his duty to vindicate the rights of the prisoners, and when asked to account to the court for his inaction, Judge Gerard Haughton expressed dissatisfaction with Supt. Larkin's explanation. SIR – As I anticipated might happen, Mr Brendan Cafferty has avoided addressing the essential points of my letter of last week, namely that the Erris community, which has been so sorely divided by the Corrib project, is exhibiting no noticeable benefits, either economic of infrastructural, from the project, other than a short-lived boost in local jobs, which is now on the wane. SLIGO-North Leitrim Fianna Fail TD Jimmy Devins suggested this week that ways of extending the Corrib gas field to benefit the north-west need to be explored. 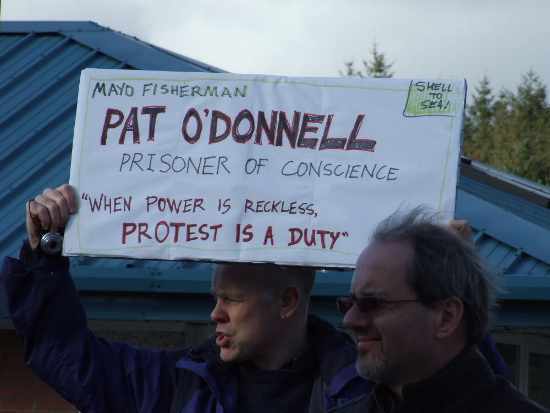 After a week when nearly all the court cases against Shell to Sea campaigners were defeated, withdrawn or thrown out, over a hundred opponents of the Great Oil & Gas Robbery from all around the country gathered outside the gates of Castlerea Prison this Saturday afternoon to protest the continuing imprisonment of their good friend and Shell to Sea colleague Pat O'Donnell. THE ENVIRONMENTAL Protection Agency (EPA) has received an application from Shell EP Ireland to review its emissions licence for the Corrib gas terminal. The review application aims to honour a commitment given to the Erris Inshore Fishermen’s Association in 2008 to revise plans for discharging produced water into Broadhaven Bay. The fishermen have been told the company will discharge at the wellhead, rather than in the bay, subject to EPA approval.